This dish is SPICY! Super, super spicy! Chris LOVED it. But pregnancy and heartburn aren’t friends and anything spicy seems to cause heartburn these days for me, so while this dish was flavorful and good, don’t get me wrong! I wouldn’t make it while pregnant if you are having trouble with heartburn! With that being said, don’t let it steer you away from making it, because it is good, really good. I enjoyed it. I just didn’t enjoy about 15 minutes after eating it. In a bowl combine, hot sauce, sour cream, and ketchup. Whisk together, add paprika and cumin, whisk till mixed. Pour half the mixture over the chicken breast in a shallow dish. Cover and reserve the rest. Allow to marinate for at least 30 minutes. Heat the oil in a skillet over medium high heat. Add the garlic and cook for about 30 seconds. Add the chicken and cooked till no longer pink in the center about 10-15 minutes. Heat the remaining marinade in a small saucepan until it’s simmering. 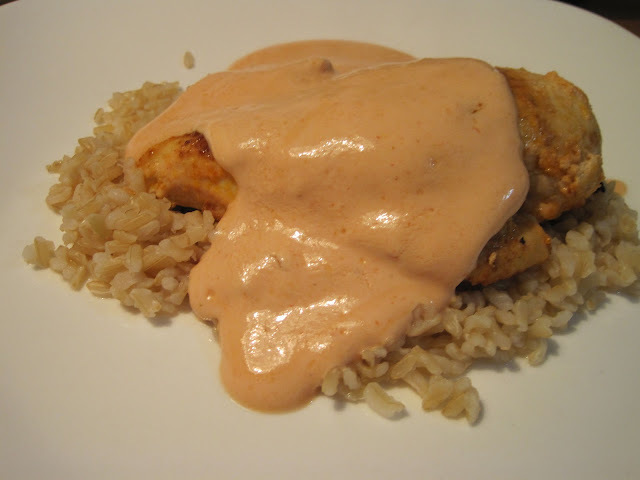 Serve chicken over rice with sauce spooned over top. This recipe has been floating around in the food blog world for quite some time and I keep seeing it appear on different blogs, so I decided I would try to make this since everyone seems to rave about it! 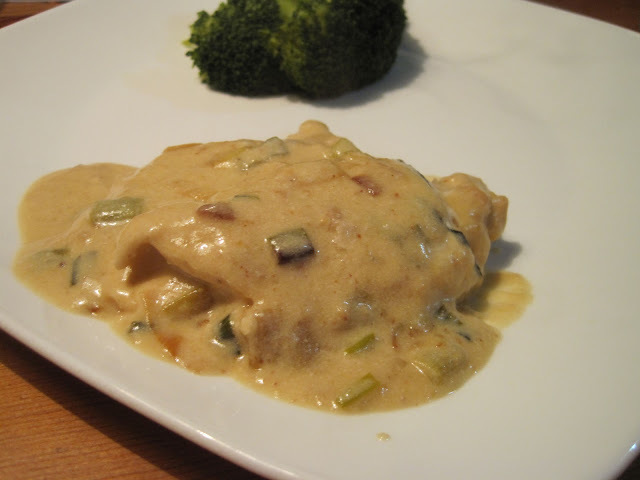 It was a great dish, full of creamy yummy sauce on top of your chicken. It’s a dish you’d expect to be crazy in calories, but it actually isn’t, if you make it the right way! Season both sides of the chicken with salt. Place 1/8 cup of flour in a shallow baking dish and dredge the chicken it. Throw out remaining flour. Heat the 1/4 of the EVOO in a skillet. Add the chicken and cook until it’s cooked through. About 10 minutes. Transfer to a plate and keep warm. Heat reaming EVOO in the skillet, add onions and cook until golden, about 1 to 2 minutes. Add remaining flour, stir to coat. Add wine, broth and the remaining salt, bring to boil, stir often. Return chicken to the pan, reduce heat to a simmer and cooked till heated through. Stir in sour cream and Dijon mustard until smooth. Turn the chicken to coat it with sauce, stir in chives and serve!